Register your children ages 6-12 in Little Green Thumbs for a hands-on, in-depth learning experience to introduce them to the world of gardening, held in the Linnaeus Teaching Garden during June and July. Books, play area, and activities for children. Find them inside the Visitor’s Barn. Each month a topic related to gardening is explored for hands-on learning in the garden or at home. 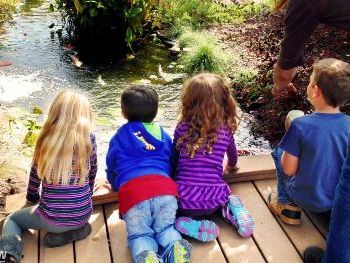 Children ages birth through early elementary will discover the wonders of the garden through the Linnaeus Gardener’s interactive reading of theme based books. An activity in the Linnaeus Garden will follow the reading. Linnaeus Garden Volunteers love to show off our garden. We are available to give tours to classes from public and private schools, home school groups, scouts, and other children’s groups.